Before getting into the real estate business in 2015, I spent 10 years doing sales in corporate America. After purchasing my first home I discovered a passion for connecting with others who were interested in achieving their real estate goals. 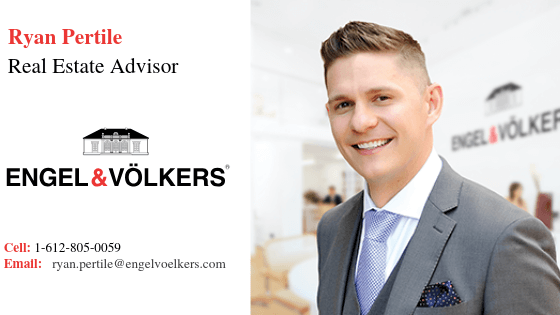 I am honored to be one of the distinguished advisors at Engel & Völkers Minneapolis, a leading worldwide real estate brokerage, and principal of the Ryan Pertile Group. After a successful start in my real estate career, I was fortunate to be connected with the leadership at our shop and am grateful for their guidance and support over the last three years. My passion for building lasting relationships with clients, paired with a relentless work ethic makes working with me and my team seamless and stress free. From first time home buyers to luxury real estate, I thrive on providing you with premium service no matter the price point. When I’m not working with clients, I can be found spending time with my beautiful wife Lisa, our young son Greyson and our crazy pup Jackson at our home in St. Louis Park or at the family cabin. There’s a chance you can find me on the golf course working on my amateur golf game.